In just a couple of months more than 210,000 38 Degrees-ers have signed a petition calling on Britain’s biggest cinema chains, Cineworld, Odeon and Vue, to stop using plastic straws. 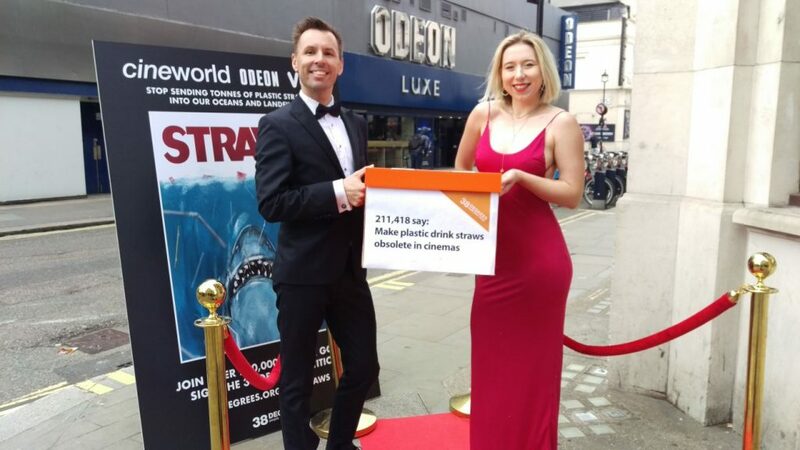 Almost 30,000 of us also contacted the cinema giants by phone, email, and social media to ask them to swap to environmentally friendly paper straws. Now, the cinemas are really in the spotlight after hundreds of us chipped in for hard-hitting adverts in film magazines and splashed out for mobile ads circling Leicester Square in London. 38 Degrees staff members, Robin and Zoe, also headed down to Leicester Square to hand in the petition to the cinemas to let them know just how 38 Degrees members feel about single use plastic. The cinemas will be hoping that it’s all blown over now – so, that’s exactly why we need to keep up the pressure! If we can add another 100,000 names to the petition, Cineworld, Odeon, and Vue will know: this campaign isn’t going away and they need to take action.